Procrastination might have been a better strategy today than getting out early. I've been busy since the holiday break, but this morning was relatively open. I thought I'd take advantage of that and go out for a run before the streets became clogged with school buses. 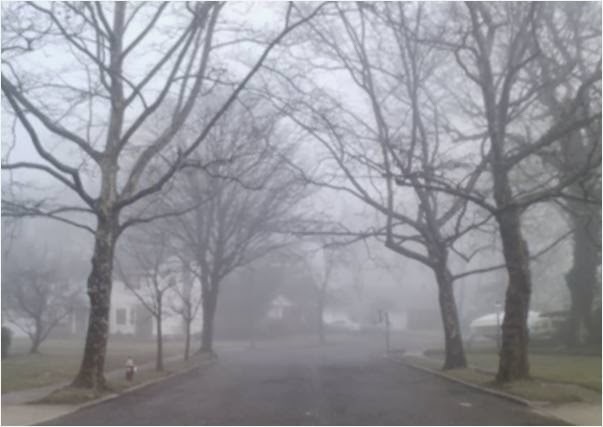 The news stations were reporting 32° temperatures, but there was lots of moisture in the air, causing foggy conditions. I'd prepared for the cold, but I had no idea that when they said fog, they were talking about the pea-soup variety. Visibility was limited to the distance between houses. I decided that in the interest of safety, I'd do most of this run on the sidewalk. I started out on a long road that borders the eastern edge of my neighborhood. This street only has houses on one side and it is often used as a service road by buses, town trucks and commercial vehicles. Running north on this road, I noticed that even without wind, the cold air felt freezing on my face. Not only that, the fog was so thick that cars, trucks and buses were nearly invisible, unless they were using their headlights. Even so, it was nearly impossible to see anything more than 20 feet ahead. I don't love running on the sidewalks in my area, but it I was glad to have them. Not only is the concrete surface hard on my legs, but careful attention must be paid to avoid the many uneven or broken sections. Catching a toe is easy to do. There was no question that if I was going to run outside today I'd need to stay off the road. Even crossing the street gave me pause. I was disappointed to see half the cars driving without lights. I was even more disappointed to see a man walking in the road with his dog with traffic at his back. I had hoped to work on speed today, but the sidewalks slowed me down. Also, even after a week, the bottom of my left foot is still a little sore. So this run will go down as another maintenance workout. No matter, it was fun running through the fog and the necessarily slower pace kept things comfortable. 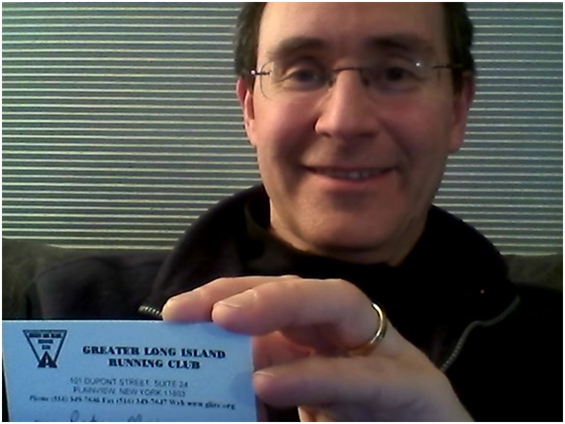 My GLIRC welcome packet came in the mail today and it included my membership card, along with four pages of information about volunteering at club events. That's a dimension I haven't experienced but I plan to participate in at least one race as a non-runner this year. It might be interesting to be the person on the other side of the table sometime. loL! I'm jumpingup and down and laughing (you know me) looking at that pic. The Runsketeers need t shirts and should volunteer at a race together. oh, and wait until you get your first Footnotes Mag. You'll love it. Yes yes! We will have our own water station and hand out Haribo sugarless gummy bears. Matching tees would be cute. The GLIRC literature said they give club shirts to race volunteers. Haribo sugarless gummies? I take it back, you are the devil.